Shall we inundate arxiv.org with pseudo-science? A little excitement is a good motivator, but objectivity makes for healthy science and genuine progress. 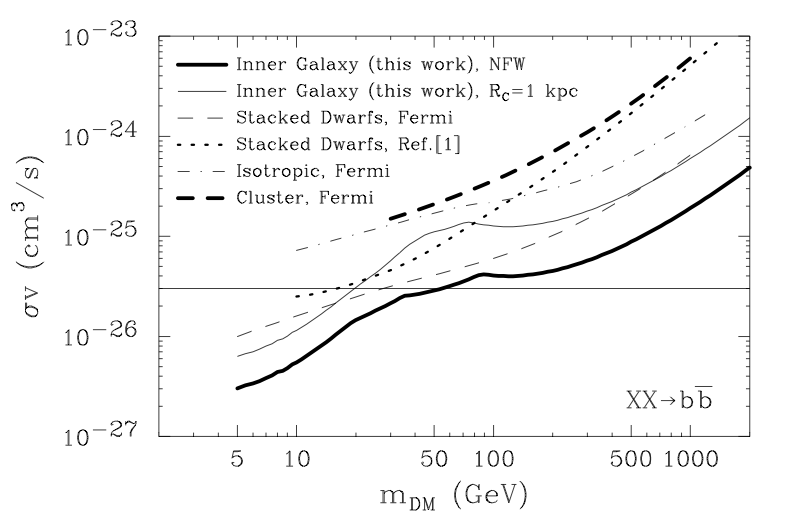 The claimed Galactic Center continuum limits from arxiv:1209.3015 are overstated, as the analysis fixes the flux and spectrum of all of the point sources except that from the most central source. There are 6 point sources within 2 degrees of the Galactic Center, and not letting their fluxes be free allows for much too strong of a dark mater constraint than that truly allowed by the data. Might be that 1209.3015 is too aggressive, but others obtain similar limits, e.g. 1207.0800. Thanks for the update, and glad to see you posting again! Disclaimer: I'm not a particle physicist (I'm an atmospheric scientist), but I have an informed layperson's interest in particle physics, and I enjoy your blog and others! Regarding the two papers discussing the line in the limb data, aren't they arguing that the line there is only "marginally" significant within a certain range of incidence angles, and that when the whole range of incidence angles is taken into account, there's no feature at 130 GeV? In fact, both papers try to argue that such a feature a statistical fluctuation, and the first points out that you can get bumps at different energies for the limb data by selecting different subsets of the data (if I interpreted it correctly; I just skimmed it). But, on the other hand are much more confident that the GC line is not, and that moreover, no plausible systematics could explain it (obviously they could be missing something). Here's my question: is it possible that the line in the limb data is actually representing photons from deep space that just happen to be near the limb, and thus may actually be due to whatever process is producing it in the GC (assuming its real for the moment)? Dan, yes, both papers argue the line in the limb is not so bad. Off the record I heard the chances of it happening by fluctuation are about 1%, so it may be just bad luck. The good thing is that we just have to wait and see if it goes away with more data. As for the 2nd question, I think there's no way the limb photons have anything to do with dark matter or any fundamental physics. The sample is dominated by radiation from electromagnetic cascades in the atmosphere. Note that, if it should indeed turn out that the DM distribution peaks some distance away from the visible Galactic Center, the continuum gamma limits would become stronger because there's less astrophysical background off-center. Klaus, that article is about the WMAP haze/Fermi bubbles. 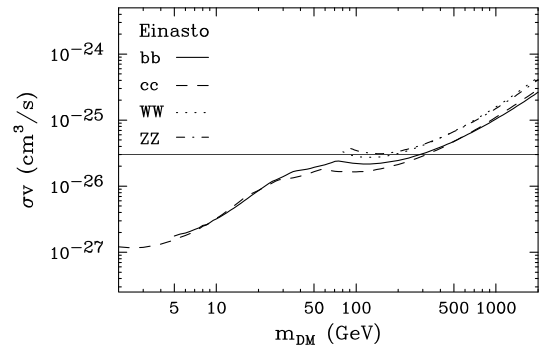 It's another phenomenon which, most likely, has no connection with the Fermi monochromatic line and, almost certainly, has nothing to do with dark matter.